Each segment is only $5! Each segment addresses a different aspect of mobility, comprising a useful mini-workout on its own. It's also possible to combine any segment with another, or all eight segments together for a holistic mobility-training program. Buy all eight segments together and save. Only $29.99! Buy the Complete Series! Buy the Video Stream Now! Steve has studied systems worldwide, then taken the best he's learned and put them into powerful beneficial sequences. Each 5-minute routine is a condensed version sequence of the best movements Steve knows. This fantastic series is available as an app for your iPhone and Android. Steve Maxwell's Gimme-Five mobility series is for the seriously time-crunched person whose circumstances limit their training plans. This could be due to a heavy work load, travel, social pressure, or even physical space. You can expect to experience increased energy, clarity, freedom of movement, optimism, and the confidence that comes with body self-reliance. The movements in Segment 5, a demonstration of the ancient 5-Rites of Tibetan yoga, have been around for millennia, but Steve considers this one of the most potent, practical routines known to him. The biggest enemy of mobility is tension within muscles. If you want to get mobile, it's important to learn how to rid the body of excess tension. Download Segment One Buy the Video Stream Now! Most people don't have the time to fool around. Steve shows you how, in 5-minutes, you can get a respectable mobility workout. A 5-minute standing series you can use as a mild workout of its own, a brief warm-up before other activities, or as beneficial movements between rounds of other, primary exercises. Releasing movements specific for tension in the neck and upper back. Download Segment Two Buy the Video Stream Now! The best of the vestibular resets. A great way to take a mid-day break, sure to stimulate the brain in a positive way, and keep the essential movement patterns intact. Can be done anytime, anyplace, anywhere. Download Segment Three Buy the Video Stream Now! Steve's all-time favorite mobility drills. If you have a stiff neck and an aching	spine, this is a wonderful way to loosen up. Not just good for the back, but tones the core structure as well. Steve proves that you don't need a lot of time to get in a great mobility drill — just a few minutes will do. Download Segment Four Buy the Video Stream Now! An ancient form of health therapy. Steve demonstrates how you can get the fountain of youth benefits of these dynamic mobilizations in just 5-minutes a day. Not a tutorial on the Tibetan 5-rites, but a useful daily compendium Steve shares to help you start each day with vigor. Download Segment Five Buy the Video Stream Now! Body tension is the biggest obstacle to mobilizing the joints. Steve shows a wonderful, breath/tension/relaxation sequence that will make you feel like a million bucks. Can be done at home or office. A great way to rid the body of accumulated tension. Download Segment Six Buy the Video Stream Now! One of Steve's most common requests is for hip mobility solutions. 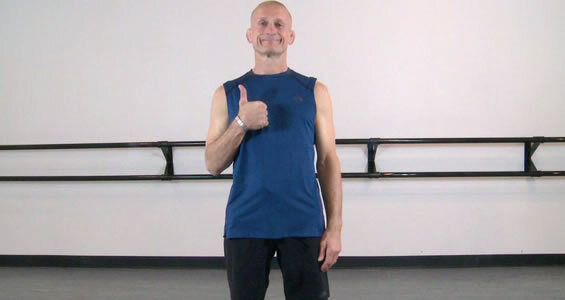 Steve shows a quick 5-minute sequence which is sure to keep the hips fluid and in-motion. If you only have time or money for one, this is it. Download Segment Seven Buy the Video Stream Now! 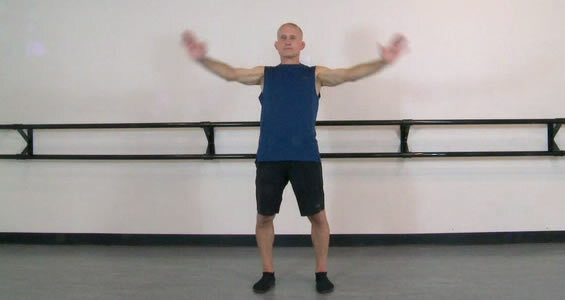 In this 5-minute section, Steve shows some of his favorite shoulder drills. Sure to keep the shoulders lubricated, loosened up, and pain-free. Download Segment Eight Buy the Video Stream Now! Hey, I spend an awful lot of time on the iPad myself. Writing, teaching, and lecturing as I do, sometimes I find myself in a bit of a time-crunch. So I'll bust a mobility move, sometimes even at the airport gate. I find these mobility routines excellent for my own personal warm-ups. And I've become a big fan of the Tibetan rites. What's offered here is in no way a complete tutorial on the subject of the 5-Tibetans, but provides an excellent, anti-aging routine in brief.